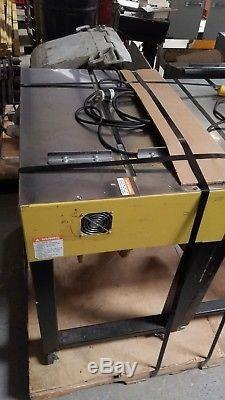 SellYourPress has a liquidation on these 4 table top strappers. The Strapack JK2 is solid and durable, manufactured with quality materials and is extremely quiet in operation. The large tabletop provides ample workspace. Automatic feed length with feed length memory. Capable of soft tension (for fragile packs). Accepts 5, 6, 9, 12mm strap. Dynaric Semi-Automatic Strapping Machine Model DF-20 Specifications: Overall Width: 21.9 Overall Length: 29.9 Overall Height: 29.1 Table Height: 29.1 Machine Weight: 149lbs. 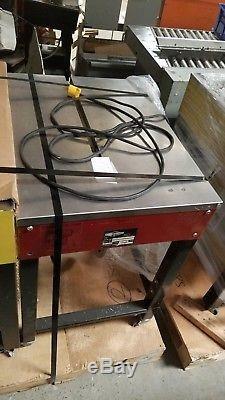 Sealing Method: Heat Seal Seal Head Location: Bottom:9.25 in from the right hand edge Power Supply: 115 volts, single phase Cycle Time: 2.0 seconds Cycle Initiation: Strap insertion with ACASS system Tension: External electronic adjustable control: 6 120 lbs. Package Size: 4 H x 2.4 W Max. The item "StraPack JK-2 Dynaric DF-20 Semi Auto Strappers" is in sale since Friday, December 7, 2018. This item is in the category "Business & Industrial\Material Handling\Packing & Shipping\Filling & Sealing Machines\Strapping Machines". The seller is "sellyourpressllc" and is located in Theodore, Alabama. This item can't be shipped, the buyer must pick up the item.